Why Fluoride is Bad for You. Increasing the fluoride intake of a patient without regard to established risk factors such as age, kidney function, weight, physical condition, water consumption, total fluoride intake, and mitigating dietary calcium is medical negligence. Although the courts have ruled that the state has the power to do so under police powers, mandating fluoridation for 25 Million Californians or the entire city of Mountain View is no less negligent. All of the organizations promoting water fluoridation agree that dental fluorosis, which is the first visible sign of systemic poisoning, increases with water fluoride levels. The Legislative Office of Budget Management acknowledges that drinking water fluoridation would increase disfiguring dental fluorosis, but since treatment of this disease is not covered for children on welfare, calculated that there would be no additional cost to the state. Clearly they are not considering the enormous legal liability for physical and psychological damage which accompany this disfiguring disease. Let's be clear about what children will be adversely affected. Bottle fed babies are most likely to develop dental fluorosis. Mothers milk has virtually no fluoride present. Those children who are deficient in intake of protein, calcium, magnesium, phosphorous, and Vitamin C are especially vulnerable to fluoride poisoning. The accumulation of fluoride is greatly increased if the person has impaired kidney function. In short, the weakest members of our society, the undernourished, the underfed and the very children that fluoridation was to allegedly benefit. In some poorer communities as much as 80% of the children have fluorosis. The test animals, in the words of the board certified pathologists, "were awash with disease." The high dose animals had kidney failure and cancers of their lips, cheeks, throats, livers, and bones. The highest rates of cancer were found in the highest dose animals. The lucky rats and mice that drank the distilled fluoride free water had no significant disease. When the actual data indicated a causal relationship between fluoride and bone cancer the NTP down-graded the results to "equivocal." Animals fed sugar-water and fluoride fare no better in terms of tooth decay than animals fed sugar-water alone. Human tooth decay is linked to diet, sugar intake, tooth brushing technique, hours of sunlight, parental education, and family income.These variables must be considered in order to produce accurate results. 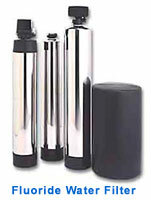 Be sure to check out our Pure Water King 5600 Fluoride Water Filter for your entire house.